Afghanistan launched its first new coins in three decades on Monday and its officials backed proposals to turn a war-damaged former royal palace into the home of the future parliament. The coins worth one, two or five Afghanis — 2.3, 4.7 or 12 cents — will be accepted all over the country immediately, the Afghan central bank said. The coins were minted in France. Officials said the coins will be more durable than existing bank notes and handier for small payments such as bus fares. The last coins, introduced in 1975 according to Central Bank chief Noorullah Delawari, were made worthless by runaway inflation after the collapse of Afghanistan's communist government in 1992 and fell out of use. In another sign of progress, Afghan officials on Sunday said they backed plans to turn a palace destroyed in the civil war of the 1990s into the eventual home of parliament. But Afghan Economy Minister Amin Farhang said it would be up to wealthy Afghans and foreign donors to pay the estimated $60-$70 million cost of the 10-year reconstruction. The war-shattered Darulaman Palace, envisioned as the legislature's eventual home, was built under King Amanullah in the 1920s and destroyed in civil war in the 1990s. It is now used by NATO snipers keeping order in Kabul. 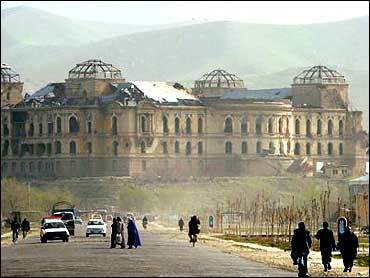 The palace's much-photographed shell on a hilltop in western Kabul has become a symbol of the destruction of the city. An Afghan architect living in Germany, Hamid Faruqui, has drawn up a plan to restore the palace. Parliamentary elections are slated for Sept. 18, and work has already begun to restore another building to house the new assembly once it is chosen. Afghanistan successfully held presidential elections in October, choosing Hamid Karzai as chief of state. The parliament vote is seen as a key next step in the country's move toward democracy after a quarter-century of war. The U.S. military has 17,000 troops in Afghanistan, pursuing remnants of the Taliban and al Qaeda, and bolstering Karzai's fragile government.